Halloween has arrived once again, and I hope you all manage to find a way to celebrate the spookiest of seasons! Yeah, it's on a Tuesday, but there's still plenty o' fun to be had. You can wear a costume to a Halloween party, hand out candies, check out some Halloween haunts, watch a horror movie marathon, play a spooky video game (like Grave Chase! 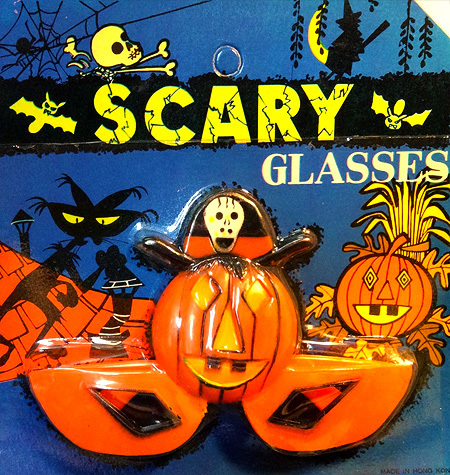 ), or go trick-or-treating. Whatever the case may be, I hope you all do something to celebrate in style! -I probably gave diabetes just by having you look at my massive Ultimate Guide To The Halloween Candies Of 2017 article. -We learned all about one of the so-bad-it's-good Michael Myers Young Adult Halloween Novels by presenting a full book report on it. -We completely revamped our beloved Halloween Jack-O-Juke, so now all of you can enjoy those 230+ spooky tunes on your computers, tablets, and even on your cellphones! -We gave the internet its first exclusive look at the original Halloween III trade ad. -We showcased the complete set of original 7-Eleven Halloween Monster Slurpee Cups. -We helped Mighty Max escape from the dreaded Skull Mountain. -We were invited to the Midsummer Scream Halloween Festival and absolutely had a blast once again. -We also had a killer time at the ScareLA Los Angeles Halloween Convention and filmed another yelling video. -We had an in-depth look at Blood Rage, a completely bonkers slasher flick. -We learned that the children in Children of the Corn may indeed like corn, but they sure hate adults. -We watched Ghost Shark and learned some very important lessons. -We unveiled a rare set of Terror 1980s Horror Stickers From Venezuela, featuring an amazing bootleg Freddy Krueger and more. -We checked out the classic Fright Night video game. -We visited the local Ambrose Avenue Haunted House and were quite impressed with what that teenager put together. -We realized that Leatherface is far less intimidating when he's reduced to pixels in the Texas Chainsaw Massacre Atari 2600 video game. -We learned about a nightmarish kid in a movie called... yep, you guessed it... Nightmare. -We shared a big photo gallery of Universal's Halloween Horror Nights, which never fails to dazzle us. -We examined the puppets in the heavy metal horror hilarity known as Black Roses. 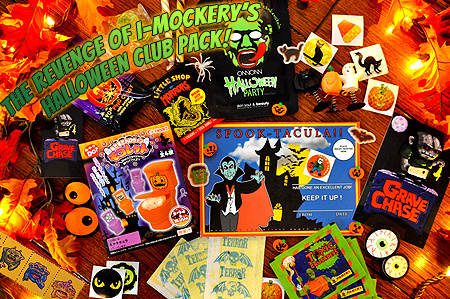 -Even thought it was later than usual, we somehow pulled off releasing yet another Halloween Club Pack, complete with Halloween toilets from Japan! -And last but not least, we finally released a brand new Halloween game on Steam called GRAVE CHASE! You know there's no time I enjoy more than Halloween each year, and having so many of you making I-Mockery your virtual Halloween home truly makes it all the better. 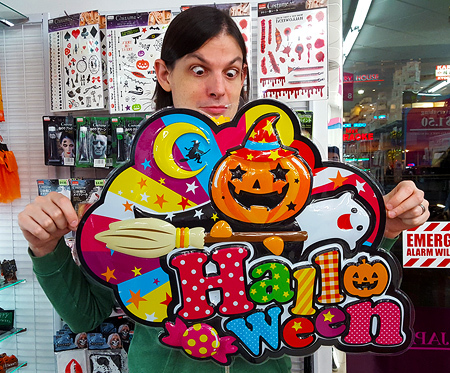 I really try to give you guys the best and widest variety of Halloween coverage you'll find anywhere online every season - from visiting haunts and reviewing movies, to taste testing candies and tracking down the most absurd & obscure novelties and more - I always try to make every season special and filled with surprises. Please continue to share the site with your friends, and I'll do my best to keep that tradition going strong for years to come. As always, I must thank Dr. Boogie his fantastic contributions to our Halloween celebration. I also gotta give Re major credit for letting me turn our home into a Halloween junkyard these past several months. 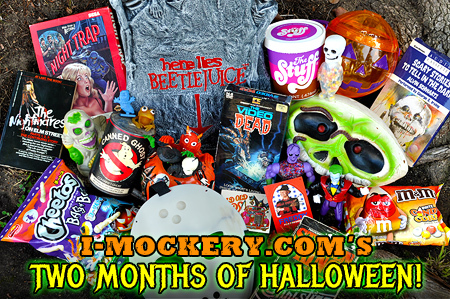 Of course, a huge thanks again to you for sticking with us during our annual "Two Months of Halloween" celebration. It's a lot of work to put all this content together, but it's a lot of fun too, and your continued feedback definitely helps keep my energy up throughout the season. If you haven't already, please follow us on Twitter, like us on Facebook, and follow us on Instagram. This is a completely independent web site, and we rely entirely on people like YOU to spread the word about it, so please do so if you can... it helps more than you could imagine! 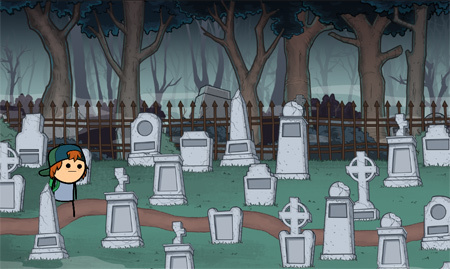 And of course, if you really wanna help out, purchase a copy of our Halloween video game, GRAVE CHASE. We put a ton of time and effort into it, and I know you'll all have a blast with it, as the game it a total love letter to all things Halloween. Please drop a comment below (whether you're logged in or not) and lemme know what you thought of the Halloween season and what your favorite articles were. Also, let me know what you did for Halloween and feel free to post photos of your costumes (if you dressed up), your decorations, or any other Halloweeny things you like! Thanks again for joining in our Two Months of Halloween celebration. Be sure to stick around, because I'll be updating the site with some more articles very soon along with some other goodies. That's all for now. Hope you all have a keen Halloween! Grave Chase Has Arrived! Now Available On Steam For PC, Mac, & Linux! If you're looking for a perfect game to play this fall season that's oozing with atmosphere, old school challenge, and relentless monsters, look no further than our brand new retro-style Halloween horror game, Grave Chase! 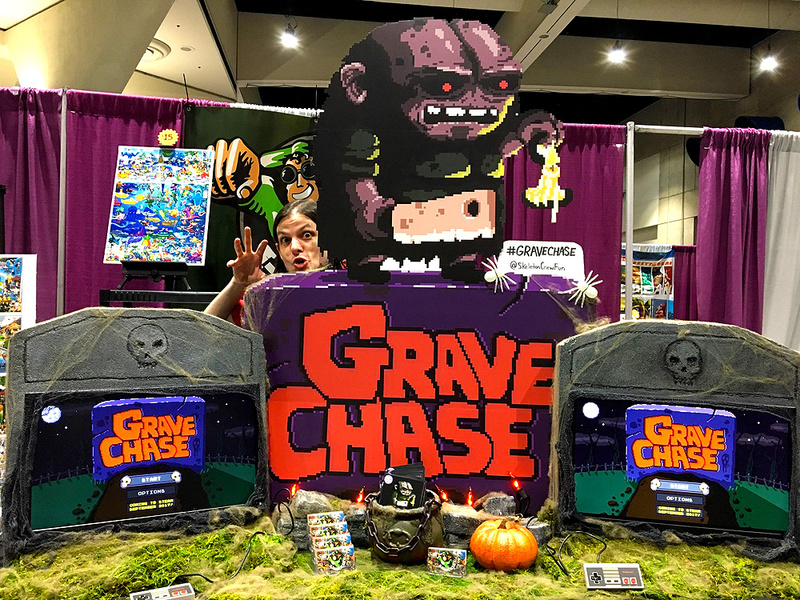 If you've enjoyed any of the many free games or countless articles I've produced over the past 20 years, I'd really appreciate it if you purchase a copy of Grave Chase. It's only $5.99 and I know you're going to love all of the throwback action. Speaking of which, if you do enjoy Grave Chase, please take the time to leave a review of the game on Steam once you've played it for a while so other potential players can see what you thought of it. The story behind it goes like this: An evil Groundskeeper has murdered everybody in a small town and buried their body parts in his mazelike graveyard. Unfortunately for him, two siblings saw him kill their parents, and now they're determined to get revenge using science... and shovels! This brother and sister duo will now traverse his gargantuan graveyard, digging up body the parts of his victims and turning them into Frankenstein-like monsters to eventually battle the groundskeeper. When I set out to make this game, one thing I really wanted was a truly memorable villain who would cause players to panic, and I believe we've done exactly that with The Groundskeeper. He patrols his beloved graveyard constantly, searching for trespassers to hack apart with his meat cleaver and add to his collection. If the Groundskeeper sees you, your only chance of survival is to run away from him until he gets winded, for he can't be killed. And just wait until you have to run from him once you've collected all body parts on any given stage for the real panic to set in. The music changes to a frantic pace, as countless hordes of the undead rise from the ground and the Groundskeeper chases you down. Can you make it to the portal before they destroy you? Can you survive the 31 days of October and get your revenge on Halloween? We set out to make a game that people would want to revisit for years to come, especially during the Halloween season, and I hope you'll all find that's exactly what we've done with Grave Chase. I love sharing the joys of Halloween with you guys every year, but getting to create a completely original video game, with monstrous characters and a spooky soundtrack for all of you to experience is a whole different kind of special. Before I go, I also need to thank some people for their tireless work on this game, because without their help, it wouldn't have been possible. Jacob West, for his stellar coding and dancing monsters; Maarten Boot, for all the killer artwork; Marie Barr, for designing our incredible Grave Chase Comic-Con booth and making the game pop with color corrections; Brad Webb, for crafting yet another awesome game trailer; John Bower; for helping QA test the hell out of the game; and Bannon Rudis, for helping out with the concepts in the early stages of production. Also, I want to thank all of you - whether you're an internet chum, or a pal who has helped promote the game, it all means a lot. We're a small, independent team of developers, and we don't have an advertising budget. We simply make the most entertaining games that we can and hope that they spread organically via word-of-mouth - so again, a huge thanks to those of you who've helped out. Alright, you've heard enough about the game, now it's time for you to play the game. Enjoy it, my friends. Grave Chase is my Halloween gift to you! The New & Improved Jack-O-Juke! I-Mockery’s Halloween Music Jukebox! It had become the Jack-O-Juke! I'm incredibly excited to unveil the big news that we've completely revamped I-Mockery's Jack-O-Juke Halloween music jukebox for the 2017 season, and we went allllll out on it! Why is this such a big deal? For starters, the Jack-O-Juke has been rebuilt from scratch with all new parts, just like Frankenstein's Monster! The old one was done in Flash, and you may already know, is no longer supported on many platforms. This new one wasn't made in flash, and it will now work in your browser, on tablets, and even on your phones! Yes indeed, now you can take the Jack-O-Juke with you on the go! In addition to being compatible with multiple platforms, the Jack-O-Juke has better features now. The random song shuffle function is finally working, it has full mouse wheel support for easy scrolling through songs, and we've added in two new "page advance" buttons that will let you quickly skip far ahead to songs later in the catalog just like on a real jukebox! You'll also notice that the Jack-O-Juke has been completely redesigned. We finally have a new interface modeled after the one you see above, only the new one is even better. Upon loading it up, you'll see we've added an animated dot matrix style LED display to the top of the Jack-O-Juke. Yes, you read that correctly; now while you listen to your favorite terrifying tunes, you'll be treated to a show of random Halloweeny animations from within the Jack-O-Juke itself! Like I said, we went all out on it this year. A huge thanks to Jacob for doing such a phenomenal job coding it, and to Re for designing the absolutely awesome new interface! Without their eerily energetic efforts, we wouldn't have such a killer Halloween jukebox to enjoy! Lastly, I've also added in even more Halloween tunes to kick off this revamped jukebox. The Jack-O-Juke is a jukebox now filled with over 230 horrifying Halloween songs to keep your decaying ears bleeding with ghoulish glee all season long! Feel free to keep the Jack-O-Juke open in a separate window so you can listen to all of the hand-picked tunes while still checking out all the latest article offerings here on I-Mockery. As always, if you would like to help me out with the bandwidth costs and show your support for our efforts, please consider purchasing a copy of Grave Chase when it comes out for PC, Mac, & Linux on September 20th this month (next Wednesday!). Every purchase helps cover those hefty hosting bills. Also, it's a really fun Halloween video game we made, so it's a win-win for everybody. Have a song to suggest? If there's a Halloween tune that you feel is worthy of a permanent spot in the Jack-O-Juke, please post it here in this blog thread. This thread will be the NEW permanent home for all spooky song suggestions, so feel free to return with all the ideas you can come up with. I can't promise I'll add everything you suggest, but I'll certainly keep an open mind about any haunted Halloween anthems you can come up with. Alright, I hope you're all as thrilled about this as I am. Now please help spread the word, go ahead and start listening to all the Halloween songs, and lemme know what you think of our new Jack-O-Juke! I-Mockery + Cyanide & Happiness! In case you haven't heard already, I'm making a video game with my pals from Cyanide & Happiness! We launched the Kickstarter for this new adventure game just a few days ago, and we've already surpassed our initial funding goal for the project to release it on Steam, so it's definitely happening and we couldn't be more excited about it! If you've enjoyed all my writing on here over the last two decades, you're going to love this game, because I'm co-writing it alongside Kris Wilson, and we've been having an absolute blast with it so far. Adventure games really allow us to fill every screen with loads of comedy, challenges, and fun things for players to interact with, so you can expect experience a lot of that in our story of a post-apocalyptic high school nightmare. We still have a lot of stretch goals we want to reach for the game, including porting it to consoles, unlockable features, and additional side quests featuring some of your favorite characters. So, with that in mind, if you haven't already done so, please consider backing our Kickstarter, as the more we raise, the bigger and better we'll be able to make this game in the end. Plus, if you back it at certain tiers, you'll even have a chance to see some of your own contributions in the game itself! And to those of you who've already backed it, I can't thank you enough for your support. This game is gonna be nuts, and I can't wait for you to see some more of the things we have planned. Lastly, I hope you ghouls 'n ghosts out there have enjoyed the first spooktacular week of our annual Two Months of Halloween celebration so far! I have more big Halloweeny surprises coming soon, so keep your eyes peeled for 'em! Dust Off Your Bones! I-Mockery’s 2017 Halloween Season Has Begun! This is it. This is our time. This is the time of the year when we come back to life and the entire world - from the biggest theme parks, to simple trips to the grocery store - turns into a spellbinding steady stream of spooky sightings. Are you ready for it? I sure hope so, because I can't imagine this tradition would still be going so strong after nearly two decades if it wasn't for all of you keeping me company throughout the seasons. 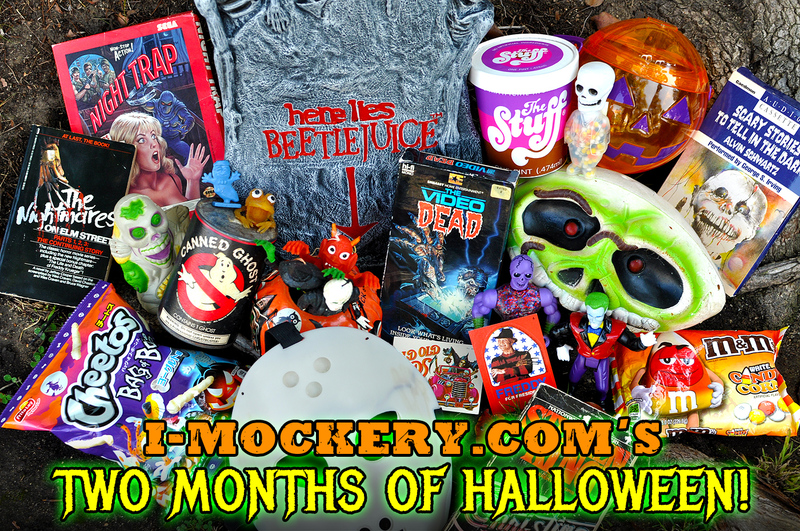 I-Mockery's "Two Months of Halloween" celebration has risen from the grave for the 2017 season, and I simply can't wait for you to see what I have in store for you this year. We're talking some BIG surprises, folks. I'm not exaggerating when I say 2017 has been one of the busiest years of my life so far, and you're going to see why soon enough. For starters, we're finally releasing our new Halloween video game, Grave Chase, on Steam for PC/Mac/Linux this September 20th, and I'm dying for all of you to play it. It's a game that takes place over the 31 days of October as you battle spooky monsters and dig your way through a maze-like haunted graveyard. Much like the Two Months of Halloween here on I-Mockery, it was my intention to create a new game that would become a tradition in your annual Halloween celebrations. Judging by the reactions I've seen from people who've already played it in various public demos, that's exactly what's going to happen, and I couldn't be happier about it. Year after year, you guys continue to carve a smile into the jack-o-lantern that is my face. To get in the spirit of things, I also attended several Halloween conventions earlier this summer, and my coverage for one of them is already up to kick off the season. So, between working on Grave Chase and attending those events, it feels more like this has been an entire year of Halloweeny fun! And just think about what we still have to look forward to! There's an actual Friday the 13th taking place in October (perfect time for a Voorhees marathon), we've already had some amazing Twin Peaks episodes (if you're a fan of the show like I am), and we're getting the IT remake (which I have high hopes for) along with a new season of Stranger Things that takes place around Halloween of 1984. Will we have something as monumental as the 2016 return of Ecto Cooler this year? Time will tell, but between those aforementioned goodies and some of the treats & candies I've seen slowly creeping into stores, this is already shaping up to be a hell of a good Halloween. Oh, and in case you hadn't heard already, I'm happy to announce that I've been working on the new Cyanide & Happiness Video Game! We're launching the Kickstarter for that game on September 5th, and have all kinds of crazy surprises in store for everyone. With our writing forces combined, you can expect an absolutely bonkers point-and-click adventure game set in a post-apocalyptic suburbia. More details on that to come. So as you can see, my Two Months of Halloween celebration isn't something I'm doing because it pays the bills; it never has been. I do this because I simply LOVE to do it. I love to share and experience the season with all of you, and Halloween simply wouldn't feel right without it. Hearing from you throughout the fall season is the blood bank to my inner vampire. So, let's put all the horrors of the real world aside for a while, and enjoy the fabricated horrors of the supernatural world for the next two months instead. Let us swim in all things pumpkin spice; let us raise our chainsaws high in the air in tribute to Tobe Hooper; let us jump into giant piles of dead leaves; and let us devour roasted pumpkin seeds until our bodies sprout pumpkin patches. We all deserve it. No excuses... it's time for a monster party. I always have and continue to treat what I do from September 1st - October 31st every year as an honor. Having worked on I-Mockery for a few years shy of two decades, I can't tell you how much it means to know that so many of you include this site in your Halloween traditions. It really is an awesome privilege to know you're all reading along on this site while eating Mellowcreme Pumpkins and listening to The Fat Boys' "Are You Ready For Freddy" for the thousandth time. So once again, I think you all for allowing me to be your petrifying pied piper, leading you into the spooky annual abyss that is the Two Months of Halloween on I-Mockery. Alright, let's get into the details of what you can expect to see on I-Mockery in the coming months. As you probably already know, we pride ourselves on going crazier over this holiday than just about any other place has in our 18+ year history, so we've got all sorts o' spine-shocking surprises planned for the 2017 Halloween season. We'll have coverage of various haunted Halloween attractions, horrific novelties, my huge annual round-up of the best & worst Halloween candies, horror movie reviews, new videos, craft projects, scary toy features, contests, and all the other wonderfully random oddities we stumble upon over the next two months. -Doc Mock's Movie Mausoleum: Doc Mock, I-Mockery's official horror host is still looking for a new home to shoot & live stream his original show at, but we have over 30 archived episodes you can still watch online. If you're looking for a good cheesy b-movie flick, check out all of the Doc's episodes that are archived on iTunes (some were archived on YouTube as well), including his Halloween specials! You can also find some of Doc Mock's special "Mini Mausoleum" videos here. In addition to a ton of new feature articles, you can still expect our regular site updates to the Blog (don't forget the archived Halloween blog entries from years past). We've also got some great Halloween contests in store for you to participate in as well. Please show your support for all the hard work we put into our Halloween celebration by following I-Mockery us on Twitter, Facebook, and Instagram to get all the latest updates. HALLOWEEN SURVEY: Share in the comments section below what's your all-time favorite horror movie? Is it an old classic that you've seen a bajillion times, or is it something more recent? What makes it such a special horror flick to you? Drop a comment below (you don't even have to register!) and let's get this Halloweeny discussion going! ONE FINAL NOTE: As a writer, the best compliment you can pay me is to chime in with your comments on all the articles I post, and to share them with your friends on various social networks. I don't pay to advertise the site or my work, it simply gets out there via word-of-mouth, so please make sure your skull jawbones ready to start moving and help spread the word. I can't even begin to tell you just how much of my life gets swallowed up by Halloween for two months out of every year, and the workload is pretty tremendous; so it's the little things like your comments that which keep me motivated and flying high on my broomstick in the moonlight from now through October 31st. All right, in the words of Conal Cochran: "In the end, we don't decide these things, you know; the planets do. They're in alignment, and it's time again. The world's going to change tonight, Doctor, I'm glad you'll be able to watch it. And... Happy Halloween." In other words... let the Halloween festivities commence!